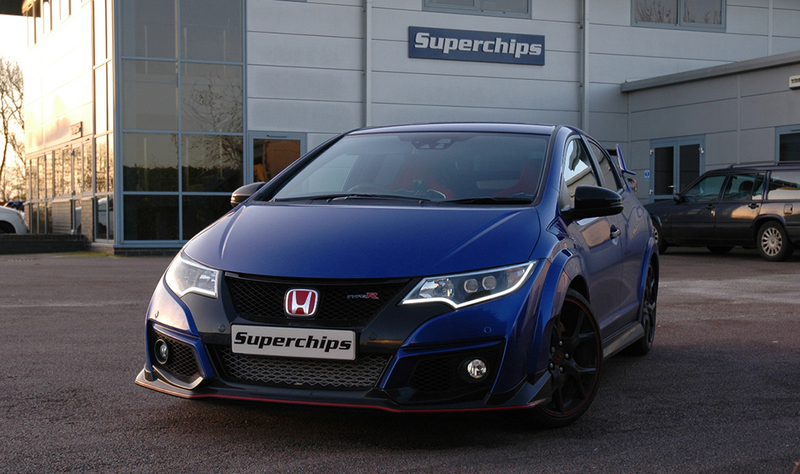 The global ECU remap leader Superchips has introduced a conversion for the latest version of the popular Japanese pocket rocket, the Honda Civic Type R.
The latest version of the Civic Type R, using the turbocharged I-VTEC engine and running on Bosch management, comes with a healthy output of 310PS from the factory. However, the Superchips remap adds significantly to both power and torque. The power outputs increases by a very useful 58bhp at 3682rpm but the torque grows by a far larger margin – a huge 115 Nm at 3439rpm, representing a gain of almost 30% over the original engine. The shape of the curves show that with the Superchips conversion, the remapped power and torque curves continue to rise at the same rate as the original car and continue much further, meaning that the car’s inherent driveability and traction is unaffected even though the power and torque increase significantly. These increases make it more rewarding to drive, with greatly improved performance throughout the engine speed range. The conversion is carried out by one of Superchips nationwide dealer network and typically takes around an hour. Customers can either wait at the dealer or drop off their car and return later to collect. The cost of the Honda Civic Type R remap is £399 including VAT and labour. The conversion is covered by Superchips’ 12-month/30,000-mile warranty*.